See the Museum's cemetery map page for the actual grounds maps of many of the cemeteries mentioned below. Please note that the Museum does not possess any individual society plot maps, just maps of the cemetery grounds themselves. Please notify me if you are certain mistakes have been made with any of these listings at postmaster@museumoffamilyhistory.com . Re your possible request for a photograph of a family matzevot (gravestone), you generally must send the cemetery a check before they will take a photo for you (assuming there is a fee.) Also, please be sure that the person you are interested in is actually buried in that particular cemetery-best to call or write the cemetery first. There are several cemeteries listed below that have searchable databases, where you can actually find the name, plot location, date of death and society name, but these are few and far between. There might be, e.g. many Louis Cohens buried in a large cemetery, so it is best to supply the cemetery with whatever information you can that will help them find the correct gravestone, e.g. the exact date of death, society name, plot location, etc. Please see the individual cemetery policies below. These policies as such may be changed by the individual cemeteries at any time. It is always best to call or write to them first before sending in requests or checks as payment as the fees might change or there may be a change in policy. The cemeteries generally offer to photograph matzevot as a courtesy (even if it's for a fee) and should not be overwhelmed with multiple requests for photographs by any one individual. If their stated policy is that they will take a photograph at no cost to you, perhaps it is good form to offer to pay the cemetery something in a form of a donation. Cemeteries get very busy too, especially during planting season, and in order to have a photo taken they generally must send one of their workers out to the grave site to take these photos. Sometimes they may even have to take the time to clear the excess vegetation from in front of the gravestone before they can take a satisfactory photo. They are not fond of this, especially if there has been no annual or perpetual care paid for the gravesite. This also takes them away from their other work such as planting and the "perpetual care" that they must attend to. Many cemeteries generally prefer to take gravestone photos only for family members of the deceased who live too far away to visit or are too infirmed to come to the cemetery. Again, the only way to know the policy for sure is to ask the cemeteries themselves. The mailing addresses are the same as the street addresses unless otherwise indicated. The two letters in parentheses represent the names of the individual cemeteries, and are used in various communications between the museum and the many researchers who visit this site. They will take a Polaroid of each matzeva you want for ten dollars per and mail it out to you by regular mail. They have no website, but will take a photo for you, when they can, free of charge and mail it to you. It's best to telephone them to make your request. They will take a photograph for you at no charge and send it to you by regular mail. Call them or write them to request a photograph. Beth El is adjacent to Cedar Park Cemetery and they share the same cemetery office. If you would like them to take a photograph of a gravestone for you, mail them a check for ten dollars per matzeva and they will take a Polaroid photo for you and mail it to you by regular mail. They have a searchable database for grave lookups. They have a website-- www.cedarparkbethelcemeteries.com. They will take a photograph of a matzevot for you at no charge and send it to you by regular mail. It is best to write them to make such a request. Cedar Park is adjacent to Beth El Cemetery and shares the same office. You can search the burial database for this cemetery by using the Mt. Carmel Cemetery database at www.mountcarmelcemetery.com . Mt. Carmel is supervising this nearby cemetery which is its Section 4. They will take a matzeva photograph for you without charge and send you a Polaroid by regular mail. You can search the burial database for this cemetery by using the Mt. Carmel Cemetery database at www.mountcarmelcemetery.com . Mt. Carmel is supervising this nearby cemetery which is its Section 5. The gates to the cemetery are generally locked. Don't ask. Call and tell them you want to visit a family gravesite and they will have someone unlock it for you at a designated time. They will charge you $7.50 per photo and will mail it to you by regular mail. You can try contacting them through their web site or call them for more details. Please note that their computerized records so far go back, more or less, to 1935, even though they had their first burial in 1908. Without knowing the date of burial, they will first check their computer. If they have no luck, they will look for the individual burial card. Interestingly enough, according to their website: "There are no burial societies at Mount Ararat only private family plots. Only one upright family monument is permitted on each plot with the family name(s) engraved thereon. The memorial for each grave is made of granite and is set flush with the ground. There are no plantings permitted on the graves only grass, which is mowed by the cemetery staff at no charge to the families. There are no annual grave care bills at Mount Ararat." They have a digital camera and will print out a gravestone photo for you using their printer, i.e. the photo will printed on plain, white 20-lb. paper, not photographic paper. They are not set up to e-mail you such photos. They won't charge you for taking a photo, but I don't think they are very anxious to take such photos, unless it is absolutely necessary. So please be prudent in your requests. If they do take a gravestone photo for you, I would of course suggest that you make a small contribution to the cemetery as a courtesy, even if there is no charge for such services. approx. 85,000 burials. First burial 28 December 1906. The burial data for nearby Hungarian Union Fields Cemetery is now available as part of the Mount Carmel cemetery database. Burials in the Hungarian Cemetery show up as being in "Section 4" of Mount Carmel. The burial data for nearby Knollwood Park Cemetery is also now online and included within the Mount Carmel database as their Section 5. However, most of the pre-2000 burials do not include the date of death (these dates are listed according to the default date of 1/1/1900). The Mt. Carmel office will take a matzeva photo digitally for ten dollars per. They have a Polaroid camera in the office and can take a photo of a gravestone for you gratis, though you might offer to send them a donation, etc. The cemetery gates are always open. At present, the cemetery will only take gravestone photos for elderly folks who live far away. They have been inundated with requests, especially by us genealogists who are requesting ten or twelve photos at a time. This is also high season for cemeteries too as this is the planting season, and the time they have available to take these photos are very limited. This also holds true even if you offer to pay them to take a photo(s) for you. What's unusual about this cemetery's website is that there is a search engine on the site where you can actually look up a deceased and if successful, you will get their surname, given name, cemetery location, society name and date of death. How about that? There is a "Quick Search" option on the main page, then once you click on the "Search" button, if there is more than one listing, e.g. for a particular surname, you will get more advanced options, such as the ability to search by any or all of the following: surname, given name, date of death (month/year), block, reference (i.e. gate number) or society name. My hat's off to them for this. They've provided a great service for us all. They will take a digital photo of a matzevot for you and mail it to you by regular mail. The charge is now fifteen dollars per photo. They will take a digital photo of a matzeva for you for five dollars per and send it to you by regular mail. They now have an online searchable database. They will take either a Polaroid or digital photo for you for fifteen dollars per and mail it to you either by regular mail or e-mail (your choice). They will take a Polaroid photo for you for eight dollars per and mail it out to you by regular mail. They will take a Polaroid photo for you for a fee of five dollars per and send it to you by regular mail. The cemetery closes early on the day preceding the Sabbath and Jewish holidays. The cemetery is closed on the Sabbath and on all Jewish holidays. 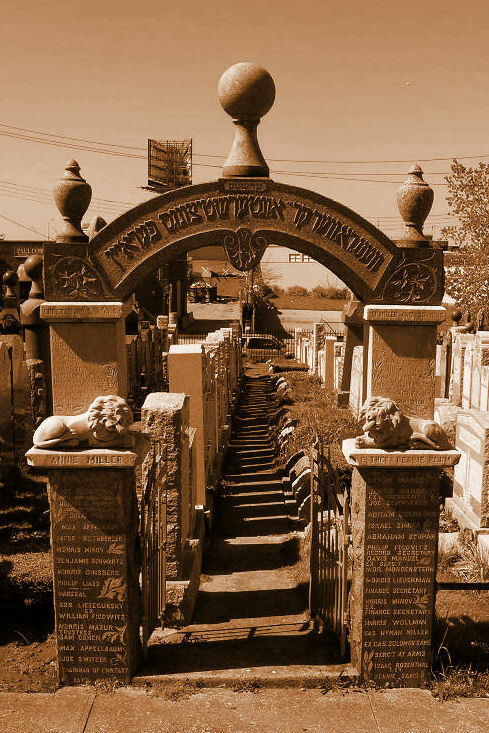 Mount Richmond Cemetery was opened in 1909, in response to the need for more graves for New York’s indigent Jewish community. Currently, the Hebrew Free Burial Association buries approximately 300 Jews a year, and nearly 60,000 Jews have been buried since Mt. Richmond’s inception. For genealogical requests, contact the Hebrew Free Burial Association. There is a minimum donation of $18 requested for each genealogical query. This cemetery, along with Mt. 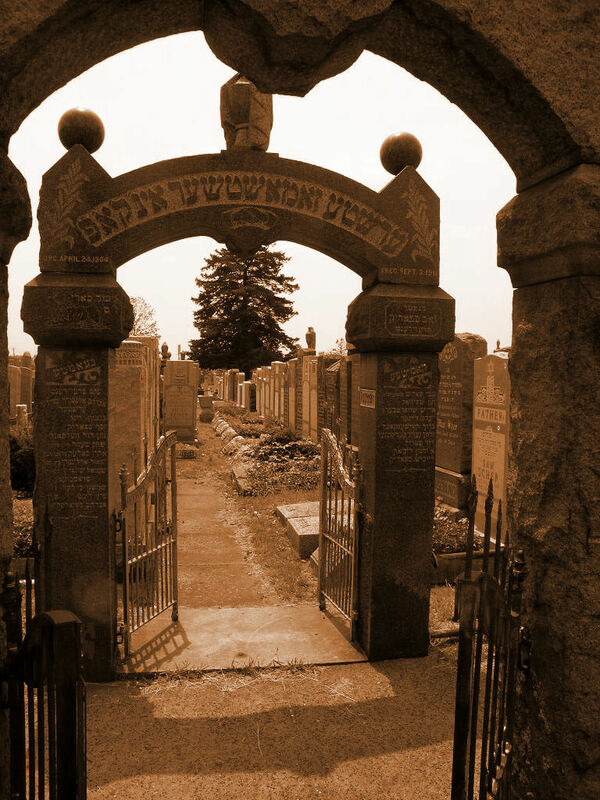 Richmond Cemetery, is owned and operated by the Hebrew Free Burial Association, 224 W 35th Street Room 300, New York, NY 10001. They will take a digital photograph for you, print it out on photographic paper to about a 3 1/2 x 5 size and mail it out to you by regular mail. All now for only fifteen dollars. Contact Karen in the cemetery office at kareng@mountzioncemetery.com . They will charge you ten dollars per photo. They prefer that you call them first so they can check their computer to confirm the burial. Then you'll send them a check for the proper amount, they will photograph the matzeva for you and mail it to you by regular mail. They will take a photograph for you for free from a disposable camera, but then you must wait until they use up the camera until they will mail it to you by regular mail. Or you can send them a disposable camera and they will send the camera back to you after they take your photos. They will take a matzeva photo for you at no charge and send it to you by regular mail. You can contact them through their website or by calling them. Please call Mt. Richmond Cemetery, 718-667-0915, to schedule an appointment. Silver Lake Cemetery was the first cemetery used by the Hebrew Free Burial Association to bury New York’s indigent Jews. For the next seventeen years, close to 15,000 Jews from New York’s Lower East Side were buried on this gently inclined hillside. Some days saw the interment of over a dozen individuals, mostly children. For genealogical requests, contact the Hebrew Free Burial Association. If you would like a matzeva photo, please contact the cemetery office through their new website. The fee is five dollars per photo for a Polaroid (ten dollars for a digital photo though they cannot e-mail the photo to you). They will digitally photograph matzevot for you and either send it to you by regular mail or by e-mail (of course, you must send you e-mail address to them with the check). The charge is twenty-three dollars for the first photo and $5.25 for each additional. Mailing address: 122 Arthur Kill Road, Staten Island, NY 10306. They will Polaroid photo of the matzeva you request for a fee of eleven dollars per and mail it to you by regular mail. For eleven dollars per matzeva, sent to the cemetery office by check, they will send you a Polaroid by regular mail. They will take a Polaroid for you of a matzeva and send it to you by regular mail if you live far away, etc. Their mailing address is the same as the adjacent Beth Moses Cemetery, i.e. PO Box 340, Wellwood Avenue, Farmingdale, NY 11735.